Let’s imagine a large ship built for a single mission. It would be designed to convert the forces produced by the wind at sea, collected by a gigantic sail, into electrical power. As the ship is pulled through the water by the wind, several oversized propellers under the ship would spin, producing electricity. The electrical power generated would then be stored in special cargo containers, which store the power like a battery. Light weight but super strong trusses and booms, supported by very strong ropes would support the sail. The ship would maneuver so its stern would line up into the wind. The ship might travel for days over a distance of hundreds of miles, pulled by the wind, before turning around for another energy collecting pass. The speed of the ship during energy production runs would be roughly half the speed of the wind. A series of pulleys and rollers would roll up an array of multiple sails, before the ship turned around, into the wind. It might stay out at sea for months at a time, filling its storage containers with electrical energy. It would then move to a port, unload its haul of charged energy storage containers, take on empty containers and then head back to sea for another energy collection voyage. The power produced by the wind follows the equation below. Eff is the conversion efficiency. I imagine a ship that would generate about 25MW of power, with a 25% overall efficiency, at a wind speed of 35MPH. Based on the above equation, the sail collection area would need to be at least 425,000 square feet. This sail might be about 1100 feet wide by 700 feet tall and might be supported by truss beams as shown in the drawing below. The ship might be about 1200 feet long and 500 feet wide. If each cargo container stored 100MW-hours of energy, the ship would be able to fill 6 containers per day or about 8.3 containers per 500 mile run. It might take two full days to complete a 1000 mile loop. Of course, longer runs might be possible if the wind conditions were ideal. 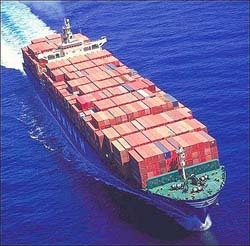 Perhaps the ship would only be able to average three containers per day. A voyage lasting 100 days would fill 300 containers. At about $10,000 worth of energy per container, the ship would be able to collect 3 million dollars worth of energy per voyage or roughly 10 million dollars per year. If we assume a 5 year payback period, the expense to equip a ship for this energy production would have to cost less than $50M. In comparison, if a hot rock geothermal energy system produced the same 25MW of power, since it would generate power 24/7, it would produce $6M worth of energy during that same 100 day period or about $21.5M for a year. This is twice as much energy as the wind energy ship, so the payback period could either be shorter or the installation cost could be more for that same 5 year payback period as described for a wind energy collecting ship. The sail on this imagined ship might exert a force of 6 million pounds of force on the ship, as it was pulled through the water at 15MPH. Can ropes be strong enough to support the forces from the wind and the weight of the booms? A single two inch diameter Kevlar rope has a tensile strength of about 400,000 pounds. It would take only 15 such ropes to hold the sail. A 50% margin might be needed so 30 or more ropes would keep the sail held tight. The energy ship as imagined should be able to supply energy to a community of 10,000 homes. A community might invest in its own energy ship, to feed it with a continuous supply of energy.